Bridges, furniture, musical instruments, games, vehicles—all of these things were invented and improved upon by people who love to put stuff together, take stuff apart, and figure out how things work! In Explore Makerspace! With 25 Great Projects, readers ages 7 through 10 explore what it means to be an engineer. They discover how inventors use science, art, and math to create new and exciting structures, games, and more. 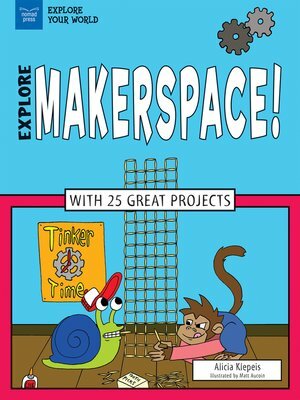 Readers also learn how to set up their own makerspaces at home, using inexpensive and easy-to-find supplies for their tinkering projects. Humans have been inventors throughout history. From the wheel to the rocket, scientists and other engineers have designed new technologies that have made daily life easier and stretched our horizons far beyond our own atmosphere. But inventions don't have to be full of computer chips or other sophisticated parts. Designing the fastest toy car made from recycled materials can be just as thrilling! Makerspaces can be found in schools, libraries, community centers, and homes all around the country. These are places where both children and adults can work with materials and use the engineer design process to come up with new ideas. Here, imagination, art, and logic combine to produce lasting lessons in science, math, and physics. In Explore Makerspace! With 25 Great Projects, readers learn how to think proactively when faced with a challenge and discover the trial-and-error processes that lead to new discoveries. They find out about the motivation behind some of the world's most amazing inventions. Through STEAM projects ranging from designing a bridge to creating board games and musical instruments, children discover how to be an engineer.